Sunday breakfast has alway been a big deal for Tim and I. When we were first dating, we went to breakfast every Sunday morning. We had a favorite place and we had a favorite waitress………..we were Sunday morning regulars………..fast forward three years, we are now an old married couple and we tend to stay home more. But, Sunday breakfast is still a big deal. We have the usual bacon and eggs, or french toast, or pancakes. But, sometimes we try something new and today was a ‘try something new day’! 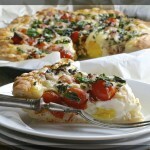 I suppose, you could consider this a pizza, but I prefer to call it a Breakfast Bread. 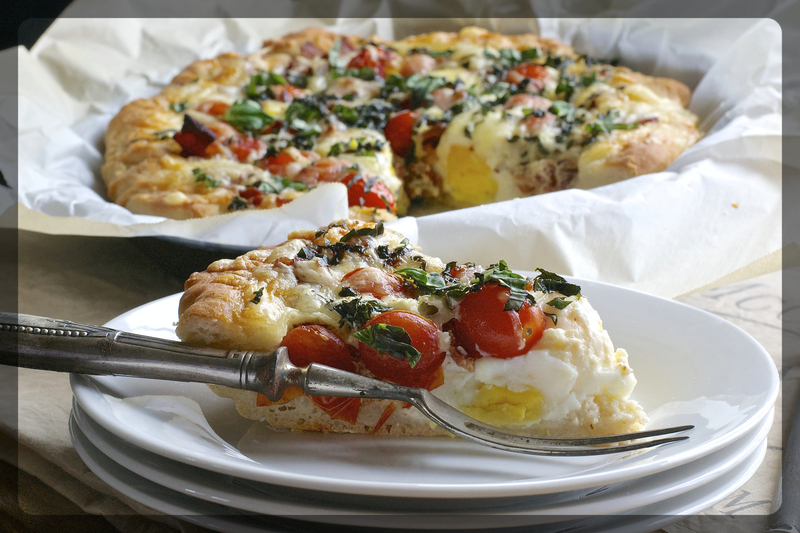 Eggs, bacon, and cheese fancied up with cherry tomatoes,basil, and spiced up with just a touch of pepper flakes! Yeast dough is scary for a lot of you……….don’t be afraid!!!! It is really easy. The dough takes just a few minutes to put together, it has a short knead time (I use my Kitchen-aide mixer, it takes all the work out of it). The rise time gives you time to prep the other ingredients. 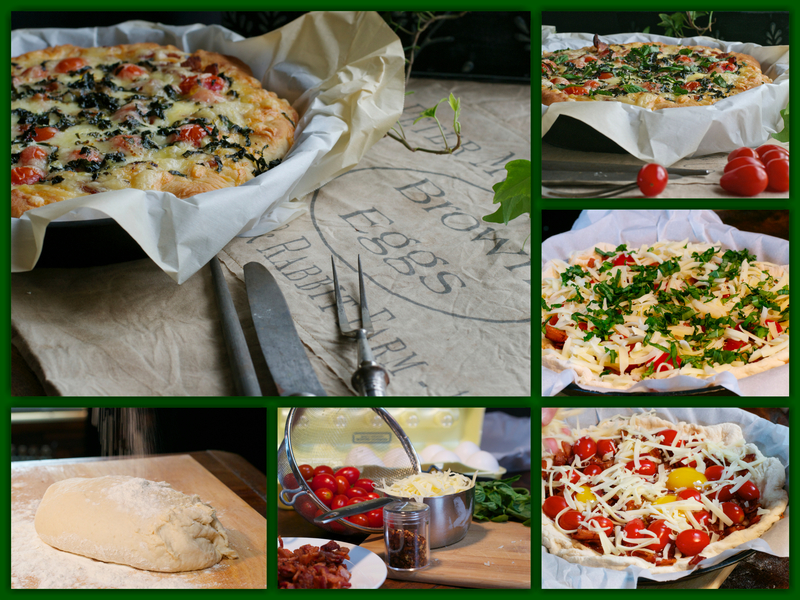 If you are really afraid of the dough, you can use a pre-made, but give the dough a try you will not be sorry. Tim and I really enjoyed this Bacon Egg Breakfast Bread……..it will join the list of our Sunday favorites! Place the yeast, sugar and water in a large bowl and set aside in a warm place for 5 minutes or until bubbles appear on the surface. Sift flour, salt into yeast mixture, add oil and mix to combine. Turn out onto a lightly floured surface and knead for 5 minutes or until smooth and elastic. Place dough back in a large bowl, cover with a clean tea towel and set aside in a warm place for 15–20 minutes. Roll the dough out on a lightly floured surface to make a 10 inch circle. Transfer to a deep-sided 10 inch cast iron skillet ( you can also use any deep baking dish) lined with parchment paper and push dough up sides. 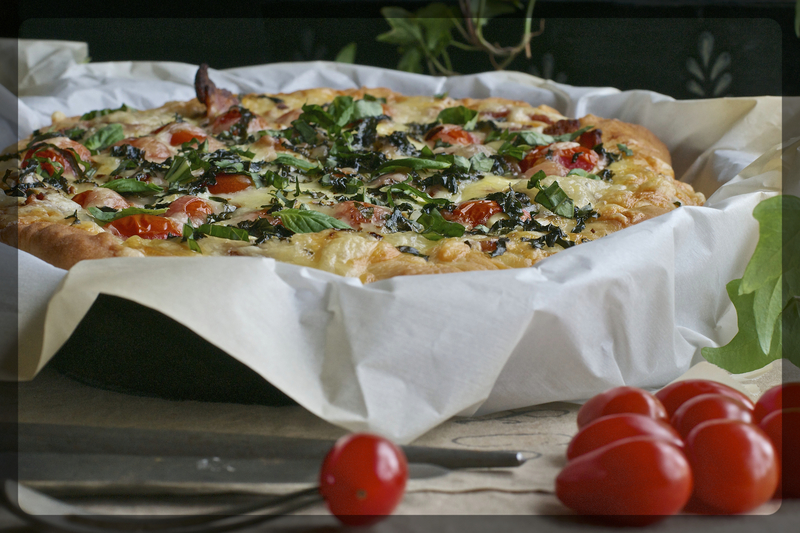 Crack the eggs onto the dough and top with the bacon and tomatoes. Sprinkle with the cheese, red pepper flakes flakes and basil. Drizzle with olive oil and bake for 15-20 minutes or until golden. Serves 4-6. You may want to broil for just a few minutes to achieve a really golden top.